Pull up the list of the Trail Blazers' franchise leaders and you'll find Damian Lillard's name just about everywhere. First in three-pointers made and free throw percentage, second in free throws made and points per game, third in field goals made and assists and sixth in minutes played despite not yet being in the Top 10 of games played. Simply put, in less than seven seasons since being selected with the sixth overall pick of the 2012 NBA Draft, Lillard has cemented himself as one of the greatest players in franchise history. And now, after moving into second in franchise history in scoring with a three-pointer at the 3:54 mark of the second quarter in Friday's 122-110 victory versus the Pelicans in New Orleans, just his 536th career game and seven years to the day since the Blazers made the trade for the pick that became Lillard, he's earned the right to be in the conversation for greatest Trail Blazer ever. He hasn't yet had the postseason success of Clyde Drexler, the all-time leader in scoring with 18,040 points, or Bill Walton, but in terms of what he's done as an individual during his time in Portland, Lillard's bona fides are on par with the elite of the elite in history of Rip City. 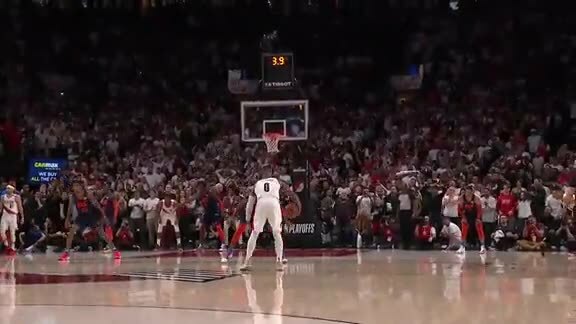 True to form, Lillard pointed out that, while he's taken every shot to get to 12,584 points, it wouldn't have been possible without the trust and support of those around him. "I think I was fortunate to come into the league, I was 21 years old when I got drafted, I had a lot of experience playing in college where I was able to grow up from a high school student to a man," said Lillard. "Away from home, learning how to take care of myself and how to behave and stuff like that, I think all of that played a part in the maturity, even as a basketball player. "So when I got here with a new head coach, new coaching staff, new GM and was given an opportunity from the jump, that was unique, too. The opportunity I had — I led the league in minutes as a rookie — maybe if they hadn’t given me that much opportunity and that much freedom to just kind of go out and do me, then maybe we wouldn’t be here. I owe a lot of people, our coaching staff, the organization for allowing me to just do me from Day One. That makes it special." Thanks to talent, opportunity and the fact that he's missed just 24 games over the course of nearly seven seasons, Lillard has made his way onto the Top 10 of most of Portland's all-time offensive statistics, so much so that his reaction lately to news of passing players long since retired has been a bit muted. After all, how excited can you get about passing milestones when it happens nearly every month or so? But that has not been the case this time around, as the gravity of being the team's second-leading scorer all-time and the fact that he's doing so by passing LaMarcus Aldridge, who he played alongside for his first three seasons in Portland, carries more much more significance for the 6-3 guard out of Weber State. "It feels a littler bigger because I played with LaMarcus," said Lillard. "The fact that he’ll be the first one that I passed that I actually played with and against, that’ll make it a little bit more significant, that we were All-Stars together two times, two 50-win teams. Beginning of my career we played together, so I think that makes it a little more significant." Considering that Aldridge, in effect, ended their partnership by signing with the San Antonio Spurs as a free agent, one might assume Lillard views his passing of Aldridge with some level of schadenfreude. But instead, he credits Aldridge, though with some regret, with making his ascension in franchise history possible. "When (Aldridge) left, I was pushed into a different role," said Lillard. "From a leadership standpoint, responsibility, production, everything had to go up. I guess him leaving Portland kind of allowed this to happen, put this opportunity in front of me, because he would probably be Number One and I probably wouldn’t have a chance to pass him until Year 15. Everything happened for a reason." Both Lillard and Aldridge have noted that their reported rift, which many attributed to the latter leaving in free agency, was, as Lillard puts it, "blown way out of proportion." In fact, Aldridge was the first person to congratulate Lillard on passing him for second in scoring, texting him prior to Portland's victory versus the Clippers on Tuesday. "You see it’s typical around the NBA. Any time two good players are paired together they try to turn them against each other and compare them and all that stuff instead of just letting them be teammates. I think that’s what it was, it was one of those things." With his former teammate now in his rearview, Lillard has to score well over 5,000 points to reach Drexler, who also is the franchise leader in games with 867, for the top spot in franchise history. If Lillard keeps up his current rate of scoring and stays healthy, it'll take roughly three more seasons to reach Drexler's mark. While a lot can happen in that amount of time, Lillard is certain that he'll end his career as the team's top scorers. "I’ll get him," said Lillard confidently. "I’ll get him."